Wow, so many people want to lose weight! Wouldn’t a weight loss drug make piles of money? Check out this business article on the new drug the FDA approved! In a clinical trial involving patients without diabetes, those who took Contrave had an average weight loss of 4.1 percent beyond those receiving a placebo. About 42 percent of those getting Contrave lost at least 5 percent of their weight compared with 17 percent of patients in the placebo group. So…if a hundred women who weighed 200lbs combined Contrave with diet & exercise, 42 would lose at least 10lbs!!! Without it, only 17 of the hundred women would lose at least 10lbs. Wow, is that a guaranteed success in the making or what? In people with diabetes evaluated in a second trial, those patients lost an average of 2 percent more weight compared to the placebo. 2%!!!! Wow, that is definitely worth adding another medication, don’t you think? Yes, at this point, I may be abusing sarcasm. I also think the FDA measurement of “successful weight loss” for diet drugs needs to be better known. Like the NIH expectations of weight loss, the FDA’s expectations are for a much more modest weight loss than is commonly expected or promoted in the press as possible. The AMA has endorsed the idea that “obesity” is a disease, not a “condition”. (Personally I consider it a characteristic.) Forbes states that this is “a move member physicians hope will spur better reimbursement for treating overweight Americans and create better health outcomes.” Exactly how it’s supposed to “create better health outcomes” when commonly prescribed treatments do not work long-term or create good health outcomes is not addressed. In good things, Shakesville’s Fatsronauts 101 series continues to hit it out of the park. The NY Times does a piece on Melissa McCarthy that doesn’t focus on her weight. That’s allowed? The NY Times also reminds people go get some sleep. Fitbit has a clip on model that I attach to the waistband of tights or to the center of my bra. I’ve had this one for a year and it’s gone through the laundry and still works…though it did count the washing and drying as 37 flights of stairs. Ana Mardoll, meanwhile, uses one to be sure she doesn’t walk too much. As it happens, I’ve had a Fitbit Zip for about 6 months now. What does it say? 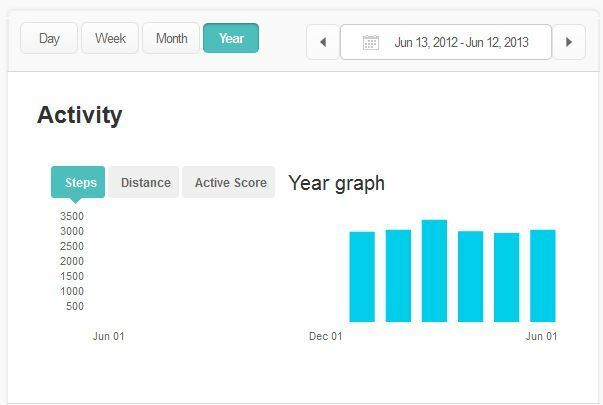 The above graph the daily average steps for each week. There’s some variations, but it varies between 2400 and 5500 per day. The daily average per month graph, however, shows a much smaller variation – from 2950 to 3400. That’s a fairly narrow range. On average, the Zip says I’m walking about the same as I did six months ago. I have become more aware of how much I walk. I thought I was more active on the weekends because I walk around the house more frequently than the office. Wrong! The house is more compact; I have to make an effort if I want to walk as much on the weekends as I do by just going to work. 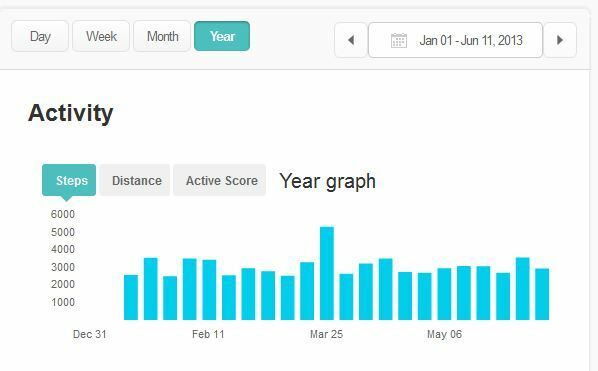 I am more consistent in my walking routine. I had noticed before I got the Zip that varying between “not walking much” and “going on a hike” would leave me with aching knees. Now I have a higher “minimum” and I have a LOT fewer problems. One gripe I’ve had about the “dashboard” is that it assumes I want to track my weight, calories, etc. No, I don’t want to log food. I don’t want to track my weight. I don’t care how many calories you think I’ve used…. Bonus reminder my Fitbit doesn’t track stairs. There’s also a beta for a new dashboard, which is better at letting me hide what I don’t care to see. Personally I prefer the new one. Overall, if you’re the sort of person who learned to disconnect from and distrust your body, this kind of tracker may be a useful tool. But like many things, your mileage may vary. People do not die of “obesity.” Some fat people die from complications of what are commonly known as “obesity-related diseases,” like heart disease and diabetes, but those diseases have only been shown to be correlated with fat, not caused by fat. (Which is why thin people have them, too.) So it’s not even accurate to assert that obesity kills indirectly. This, however, is a thing that is accurate to say: Fat hatred kills people all the time. This is not an arcane statistical point or a mere technical criticism of one academic article. Too often, relationships that are far from being understood are assumed to reflect a particular, strong causal connection, leading to no end of regulatory mistakes. I missed the husband who loved me no matter what, not the new anti-fat crusader he had changed into. But he felt the same way: he’d fallen in love with a plump-but-not-fat woman who wanted to be thin, and now he had a fat wife who’d “given up on herself.” And Ihad given up: given up on dieting, given up on the idea that my body needed to be fixed. I already wished I hadn’t spent so many years beating myself up for being fat; I wasn’t going to stay in a marriage where my husband did it for me. The article is good, and bonus points for a photo of the author in scuba gear with the caption “Cage diving with great white sharks: more fun than dieting”. I adjusted the layout, let me know if you can’t find things. Also, let me know if you have additional topics or questions you’d like me to write about. As for resolutions, well, there’s resolve and then there’s Resolve the carpet cleaner, (Two Lumps). There’s also ASDAH’s Resolved: Addressing Weight Bias in Health Care Project, collecting health care stories in video or written form. Please see their site to see what they are asking for and the submission methods. People are living longer! I thought this would be a good thing. Oops! As Fatties United discusses, some people aren’t happy with this. Since so many fat people have had the audacity to keep on living instead of dropping dead on schedule, Dr. Mokdad is predicting that all these fat folks will be old sick fat folks and require lots and lots of medical treatment. Study results show that “normal weight” folks don’t live longer than overweight folks? (Again?) Oh noes, must include lots of fat panic in the news coverage! Charlotte Cooper writes about The UK Royal College of Physicians and their concerned about obesity! Oh dear. But the report, as is typical in a medicalised discourse of fat, is entrenched in a view that regards weight loss as the universal solution to the problem of fat people and health. The authors throw about “severe complex obesity,” a term they’re obviously pretty proud of, coming soon to a healthcare provider near you, and bound to further medicalise and stigmatise fat people. They make the crucial mistake of failing to question the effectiveness of weight loss at all, so it’s not weight loss surgery that ruins fat people’s health, it’s the fact that the care pathways surrounding the surgery need tweaking. This ties them up in all kinds of knots, looking for answers in the wrong places, for example suggesting that the UK needs a Michelle Obama figure to galvanise the population against obesity, even though her crusade in the US has been disastrous in re-stigmatising fat kids, and even though we’ve already seen Jamie Oliver screw things up over here. Anyway, let’s be careful out there. Now, I’m going for a walk.